Should a Nonexempt Employee Be Salaried? Most employers know that any employee who qualifies as exempt from overtime under the Fair Labor Standards Act (FLSA) must be paid on a salaried basis. Being paid on a salaried basis means that at least the minimum agreed salary for the week is paid, even if the number of hours worked may fluctuate. And in the case of salaried, exempt employees, the salary level must meet or exceed the amount in the regulations (currently $455/week, as of October 2018) in order to meet the criteria to remain overtime exempt. But what about employees who are not exempt from overtime pay (nonexempt)? Can they also be paid on a salaried basis, as long as overtime pay requirements are met? What are the pros and cons of doing so? Can a Nonexempt Employee Be Salaried? The short answer to the question of whether this is permissible is yes. 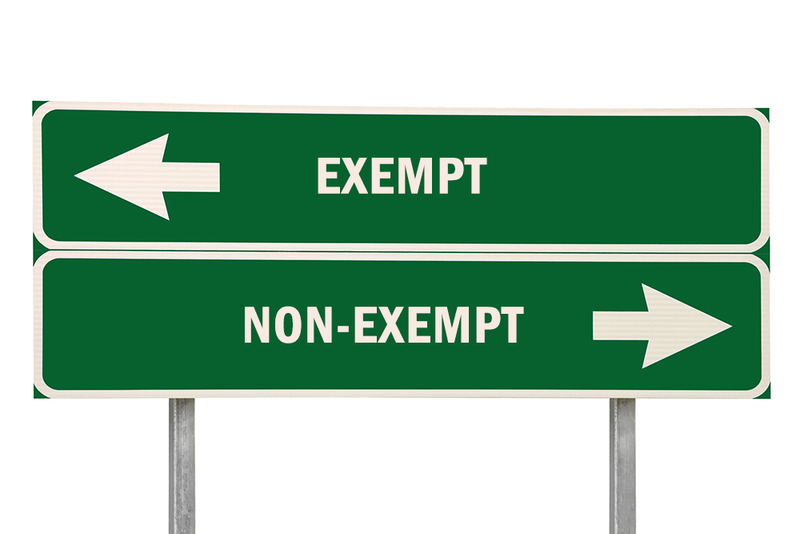 Employers have the option of paying a nonexempt employee on a salaried basis rather than on an hourly basis. They may choose to do so for a variety of reasons, not the least of which is it may simplify payroll administration if no overtime hours are worked (more on that in a moment). It could also make it easier to estimate monthly labor costs. Another reason employers may do this is for employee morale. Being salaried may be seen as a sign of status or trust for employees. Yet, another reason may be simply because the employee was already set up as a salaried employee when the determination was made (or changed) that the role was not exempt from overtime. That said, there are some significant downsides to taking this route. The payroll administration may not be simplified much. Counter-intuitively, all hours worked still need to be tracked. This is true even if the organization has “outlawed” overtime. Hours must still be tracked to ensure local, state, and federal overtime pay obligations are met when necessary. If this is not done, there are risks that Fair Labor Standards Act (FLSA) overtime pay obligations will be missed. Is the regular rate of pay (and thus the overtime pay) calculated on 40 hours, calculated on the average hours worked, calculated on the exact hours worked only the week in question, or some other number? The amount of overtime pay owed will vary, depending on how it is calculated—which is where employers may get into trouble inadvertently. Different employees may have differing calculations, depending on their exact situation. Note: there are concrete answers to these questions under the FLSA, and there may also be local or state regulations that advise how the calculation must be done. The point is that there’s a lot more potential for mistakes to be made that could result in inadvertent wage/hour violations. For much more in-depth information on how the calculations are done, click here. Also check out this document for more information. For many employers, the risks of miscalculations (and the complexity in getting it right) may outweigh the benefits. What has been your experience?